SK has made some wise statements over here. Progress requires assertiveness. This applies to many things, including forum administration and content creation. Yeah you're right about the first part. Maybe it's my autistic ignorance that'll be my downfall eventually. I do. Every day. No new posts. Every day. The Smash Ball lights up but nothing is there. Looking through it it looks all done but no. I wrote a to do list. Something I can read and interpret. I can be more helpful now, at least I would think. But I'm derailing this thread, so I'll shut up and open audacity again. perhaps, instead of finding a random new admin, we can build one from the ground up. So if you got a bad rep in the community, which i know very few of you dont, i would not recommend taking this challenge. Jesus christ, what is that supposed to mean? I can't think of three hostile people on this forum. Yeah screw Blitz! That guy's the worst. Well, I guess I haven't seen as much knowing how new I am here. I haven't really wanted to say anything. But I'm kinda sorta interested in being admin. I for one support StayPuft as admin. Caveat: The small smashballs are broken. Currently, I think I am confident of either Kirby or Dust for Admin. Do you mean mod or admin? Shouldn't mod be like, a stepping stone to admin? 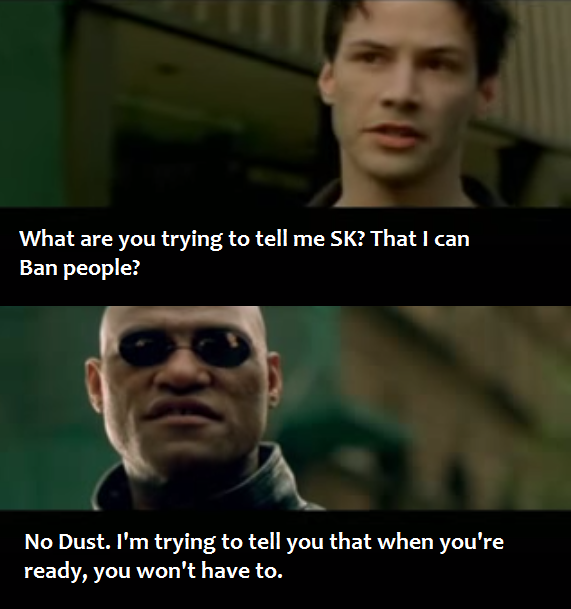 So dust will be able to ban people. I'm down for Dust as admin. Dust sounds like the perfect admin. Oh you mean this is all for when SK sent out job offers for someone to handle the site.